When it comes to deciding on a wedding invitation most couples will go with something relevant to their colour scheme and don’t get us wrong, there’s nothing wrong with the traditional wedding invite, it’s just sometimes it’s nice to mix things up and inject a little fun into your invitations! Here we’ve compiled a list of our 20 favourite fun and unique ideas for wedding invites! How about a scratch card invite to reveal the date of your big day? For all of the book lovers out there, wouldn’t it be lovely to send your guests your invitation on the inside of a beautiful book?! ‘Pencil Us In’ A play on words is a fab idea for a wedding invite! Or charm your guests by sending them a chocolate bar! A pull out invite is another fun and inventive way of inviting your friends and family! We loved this modern day ‘message in a bottle’! Or even the classic message in a bottle would work perfectly for a beach themed wedding! Using typography to tell the story can be an adorable idea and adds a personal spin on the invitation! Perhaps if you’re having a travel themed wedding you could use invitations that look like passports? If you really want to go for it with your invites then this view master is absolutely incredible!! It displays a series of images of the couple plus all the details of the wedding date throughout the slides! Perhaps a simple flow chart invite is more up your street? Simple, yet still tons of fun! The invite on the inside of a reel of film?! Genius! Our friends over at ‘The Original Wedding Tea Towel‘ created this fun invite on…well a tea towel believe it or not! 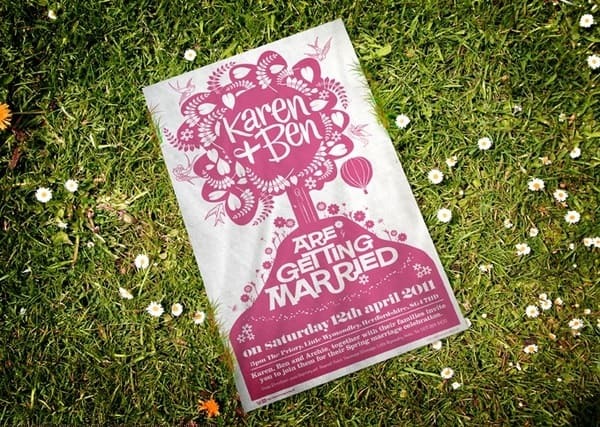 Perfect for couple’s with an Eco friendly approach as the invite can be used over and over again! How about a very clever invite that literally lets your guests know you’re ‘tying the knot’! We absolutely loved this invite!! So cute and funny! And gives the guests a great RSVP! Very creative idea of using thumb prints to create a heart! Simple and effective. This invite was designed for a Birthday Party but we think it would fabulous for a wedding invite! Have your guests blow up the balloon to reveal the details of the day! If you’re getting married around Christmas time it would be so beautiful to have an invitation in a ball ball! All of the details can be carefully typed up and stuffed inside the ball for the guests to pull out read! It would make a gorgeous keep sake of a memory to hang on the tree too! Invites with a fun RSVP are always a great laugh and would be brilliant to display them on the day too! We can only imagine the comical replies this couple got back! I’m Australian and we Aussies always want our stuff to be unique. Wedding Invitations included. My wedding planner told me about Unique Custom Products in the USA. I emailed and called them and they made me beautiful wooden invitations.Our engagement picture was engraved and the design was simply awesome. I love the old film canister idea. That’s a great way to reuse those (sadly) archaic things. Also, how in the world did they create a scratch off save the date? So cool. I made a save-the-date magnet with a photo of the cake toppers (designed to look like us). It worked out well. In fact, it is still on the fridge of my parents, my in-law’s and a few of my friends. Brilliant ideas for couples wanting something completely unique. Love, love, love the tea towel! really love the tea towel idea! I’ve just written my own top 5 ideas but they are not nearly as creative as these! I love the film canisters, and the balloons how wonderful. I just need to find me a fiance and i can put these ideas to use! These are wonderful and creative ideas for a unique wedding invitation or save the date. The pull out invite is such a great idea. It’s probably a lot of work to do it DIY but it’s possible. I also wonder how and where you can make scratch cards ? I would like to say this is an excellent creative ideas for a wedding invitation…… Your post great information you have post here. Thanks for sharing this information. Well done! Amazing creativity and ideas. Thanks for the share! It s really unique wedding invite ideas, I like all the ideas specially tying the knot wedding invite cards idea. Awesome ideas. Love that “thumb print love”. Simply fantastic! Really like the scratchcard invites. We bought everyone a lottery ticket as our wedding favour! Hi, i really love the chocolate bar and cinema ticket wedding invite. Can you tell me where i could find these on the internet? Im looking at getting some wedding invitations done. these ideas are great on here. Thank you very much for your good posting. Next mont I will married. I get one design in your article that inspire me to create it. You have share amazing wedding invitation. I like your beautiful collection thank you for this post. These are such awesome Ideas! Some are so very simple but so fresh. This would really leave a great impression with your family and friends. The scratch out card and the Christmas ball ideas are genius, such a simple yet effective idea for the themes of these couples weddings. Paper can do wonderful things for weddings! Really love these ideas! They are super quirky and fun – a really fresh approach to the wedding invitation. The chocolate bar idea is fantastic! And the message in a bottle is such a great traditional/modern mix – love them all! Interesting ones .. Specially the ball ball idea is a superb thought ! Thanks for the share. I’m interested in the winter wonderland Xmas ball invites. What’s the prices? I like how unusual they are. Unfortunately this post is now nearly 4 years old and we do not hold information of who the seller was, please accept my apologies for the inconvenience. Really funky wedding invite ideas. I love the pencil us in one, it is really unique. very lovely as well as innovative…. These are mega cool ideas. Absolutely loved this post. These are very interesting and unique wedding invitations. Hope start getting these in India as well. Nice collection. Keep it up, guys. AMAZING examples! Thanks so much for sharing! There should be a Creative Market “Like” button for it! I don’t know… if someone sent me chocolate in their wedding invitation, I would pretty much have to go! The same goes for the woodcut one- FANTASTIC! In 2018 still wonderful and creative examples. Thanks for sharing the unique wedding invitations. One of my friends is searching the best wedding invitation ideas for her wedding. This would be very helpful to design her own wedding invitation. Thanks for sharing your ideas.